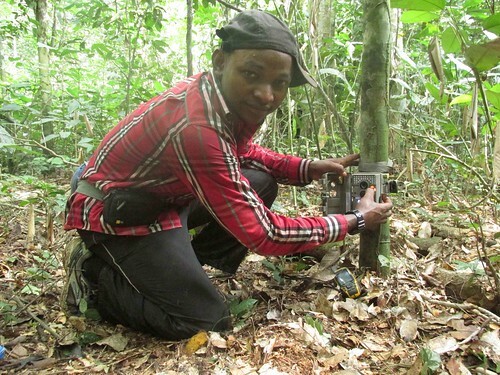 Junior placing a camera trap. The video that Junior downloaded December 15th 2016. We knew Okapi were in the Lomami National Park. We knew it because we found dung, prints and feeding sign, but only on the west bank of the Lomami River. This was confirmed by David Stanton. He did genetic sequence analysis using Okapi and Bongo dung which are often confused in the field. 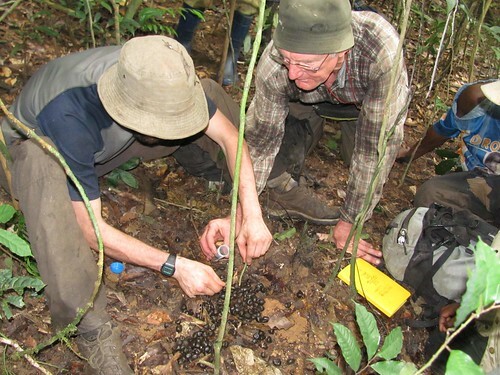 David Stanton and John Hart collecting Okapi dung on the west bank of the Lomami River. He confirmed Bongo in the park on both sides of the river; Okapi, he could confirm only on the West Side of the River from the samples that he had. Okapi occurs only in DR Congo where its range includes three national parks (Virunga, Maiko, and Lomami) and the Okapi Reserve. 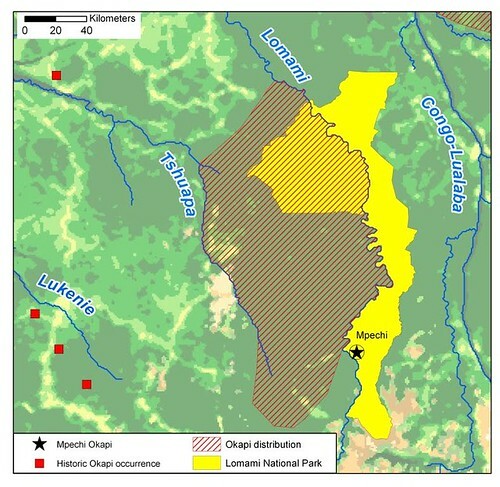 The Lomami National Park protects the Okapi in its isolated southwestern range, where the Lomami River is a biogeographic barrier for a number of other taxa including red colobus and the lesula. We wanted evidence beyond feces. A greater number of Congo’s unique, flagship species are in the Lomami National Park than any other Congolese protected area. We wanted photos of all of them. Arboreal primates we have mainly gotten on our point-and-shoot cameras (including dryas and two endemic red colobus), others we have gotten on camera traps: Congo Peacock, Lesula, Dryas, forest elephant, Bonobo … but not Okapi. Bonobos captured on camera trap in the same area where the okapi video was recorded. Congo peacock in the Lomami National Park. On the west bank, in the known Okapi range, we used camera traps to survey three forest areas, covering 4 to 15 km2. Each grid was comprised of 20 cameras and was active for two to three months. BUT in more than 3500 “camera days” on the west bank where we expected it, not a single okapi was recorded. Okapi track on the west bank of the Lomami River. We used camera traps, same method to record other animals on the east bank. Four grids have been surveyed, accumulating a total of 4200 camera trap days. It was at the last grid, at the end of the session in Mpechi, that Junior found the okapi video. 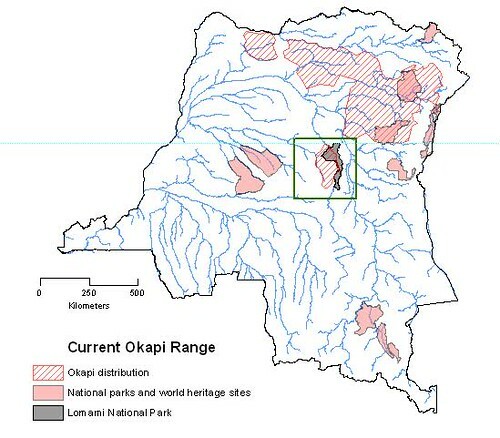 The western range of Okapi with the new find at Mpechi, only 10 km further east but separated from the previously known distribution by the Lomami River. A beautiful, healthy young female okapi. The key question: Did we just discover an isolated elusive population, or is she a one-off migration event? And if so HOW did she cross the Lomami River? According to David Stanton, Okapi’s very high genetic variability suggests multiple events of separation and remixing . So ancient dispersals, in perhaps different forest geographies, led to repeat interbreeding over okapis approximately 2 million year history as a species. 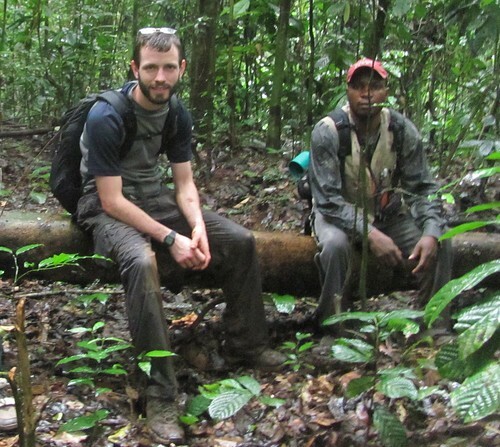 David Stanton, with Louison, on his dung collecting mission through the Lomami National Park. Certainly the Pleistocene periods of wet and dry were pertinent. During the periods of spreading forest Okapi migrated into expanding appropriate forest …but when did they cross the Lomami a river whose head waters are deep in the Katanga savannas, or even more formidably, the Congo/Lualaba River itself? 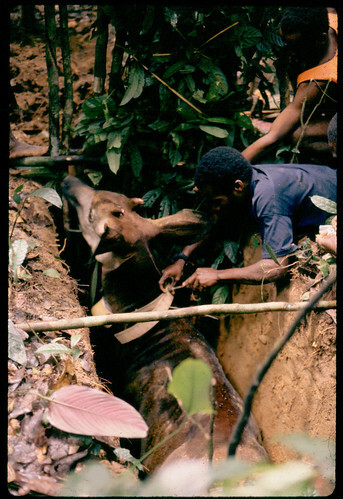 Dieudonné fixing a radio collar during our okapi study in the late 1980s. Our 1980s radio collar study of Okapi in the Ituri Forest (link) revealed that okapi spend their first months on their mother’s territory; as sub-adults they migrate out, sometimes moving many kilometers. But the Okapi, giraffe-gaited, have never been reported to swim and could probably only do so poorly. 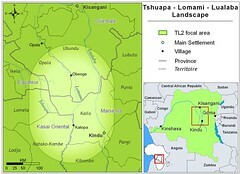 The Lomami has a deep channel and a strong current. 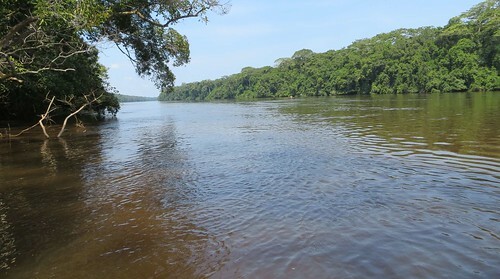 The Lomami River, at the level of Mpechi and throughout the park, appears to be a formidable barrier. Were we the only ones that did not know about this cryptic population? 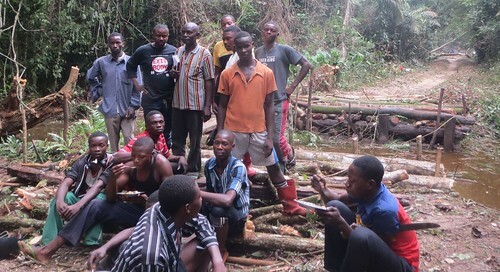 Junior undertook a survey of local Ngengele and Langa hunters in the buffer zone closest to the Mpechi forest. This bongo was recorded on a camera trap in the Lomami National Park buffer zone which is open for local hunting. When Junior showed the hunters the okapi videos and field guide drawings. They were surprised. The only large stripped ungulates they recognized were the bongo, bushbuck and sitatunga. All occur in their area. But pride and recognition of value were the most frequent responses. The news spread. Last week in Kindu Sony Kangese , a Mungengele with a construction business, told John Hart “We now know how important it is to protect the new park.” He had heard about the discovery from a family member. Sony, in striped shirt, with a local work team during bridge repairs. We now have a challenge: Is this a cryptic population or a lone migration event? We plan to collaborate again with Dave Stanton and this time to do a more thorough combing of east bank forests for Okapi and Bongo dung. This entry was written by Terese Hart, posted on 2017-02-21 at 12:23 pm, filed under Okapi, The Forest. Bookmark the permalink. Follow any comments here with the RSS feed for this post. Trackbacks are closed, but you can post a comment. Great to see this on the blog, what an exciting find! Interesting to read your thoughts on the possibility of a remnant population in the east, or just one exceptional animal able to disperse across the Lomami. Perhaps they can swim better than expected?There is some evidence of giraffes’ ability to float, perhaps the less exaggerated form of the okapi make it a more capable swimmer? 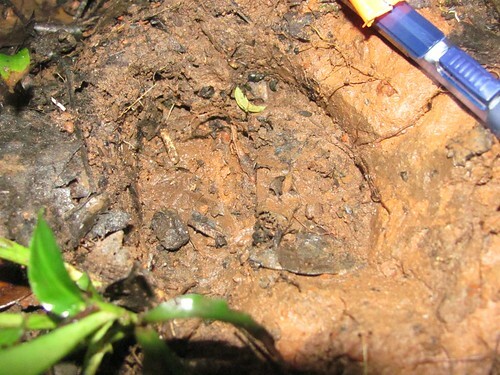 Hope to see further evidence of okapi on the east bank. Congrats on another great find in the park. Hi Terese, this is a wonderful surprise – this shows that it never hurts to look further and wider than we might expect to be reasonable. Beautiful images – and exciting times for TL2! This is exciting news! Congrats to you and your crews for catching Ms. Okapi on film. Thanks for the related links, especially to the film of the Ituri. I’m watching it again. Awesome work, guys! This made my day. Thank you Daniel for your comment on the “floating” giraffe. That would definitely be something to know more about. I agree that we need to reconsider okapi’s abilities to cross water. David found little evidence that other rivers were barriers to gene flow in the eastern range of the species…The Epulu, Ituri etc. Not as big as the Lomami, but not walk across streams. Here is a link to an article the analyzes a giraffe’s swimming potential. Daniel, A very interesting reference. Thanks! Congratulations on a significant discovery! And superb to see the footage of the Congo Peafowl and interesting that it was such a relatively large flock, I counted eight birds?